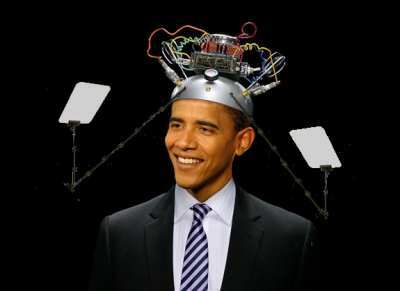 The Communicator-in-Chief: Has teleprompters will travel (to your local elementary school) LOL! | the "silent" majority no more! The Communicator-in-Chief: Has teleprompters will travel (to your local elementary school) LOL! We did notice the difference in the background… a clue that Obama had possibly changed class-rooms … the video of the audience looked like the press was now down front and not the kids. The great communicator? You’ve got to be kidding me! He places a WALL of teleprompters ( and SPEAKERS) between himself and the kids in the classroom. This is a 6th grade class at Graham Road Elementary School in Falls Church, Va. Thanks to Pamela Geller at Atlas Shrugs for posting this. She is the BEST! You mean that vision of him being isolated by a wall of technocrappola doesn’t give you a warm and fuzzy feeling for his superior intellect? Off to the reeducation camps for you!